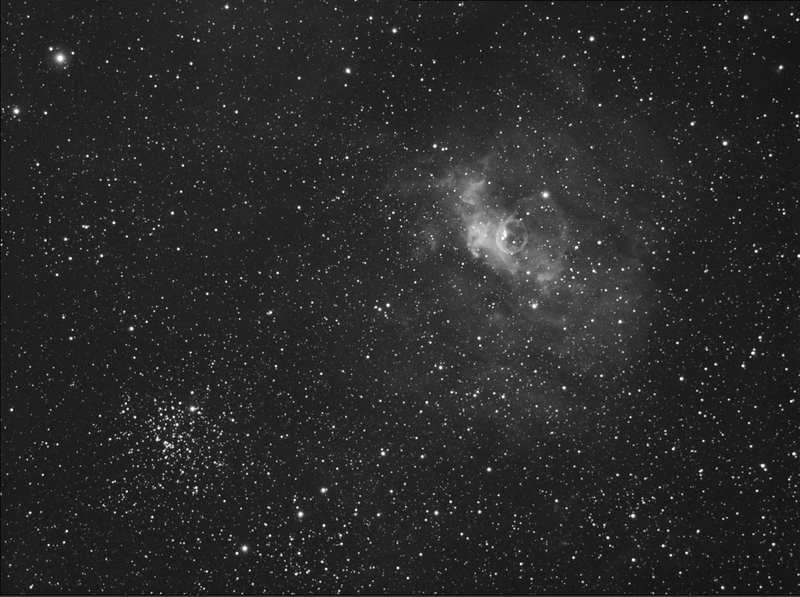 Dec: 61 degrees 12' 00"
The Bubble Nebula is one of only a few "bubbles" identified in the night sky, and it forms a photogenic partner with the open cluster M52, seen in the lower left. It is an unusual planetary nebula named for the surrounding bubble that is seen in the upper right portion of the photograph above, caused by gas ejected from a massive central star. The rate of ejected gas is so brisk that it "runs into" the wall of the surrounding nebula, thus creating a boundary of higher density gas that forms the outer shell of the bubble. More information about this process may be found here. Filter: Astronomik Ha filter (13 nm bandpass). Exposures: 16 x 5' each, binned 1 x 1, 80 minutes total. Conditions: Temperature 60 degrees F; below average transparency; very humid; excellent seeing; calm. Post-processing: No dark, bias, or flat frames used. Auto-aligned in MaximDL; Sigma combined using RC Sigma Reject MaximDL, followed by DDP in ImagesPlus (IP). Subsequent levels and curves adjustments in Photoshop CS (16 bit format).